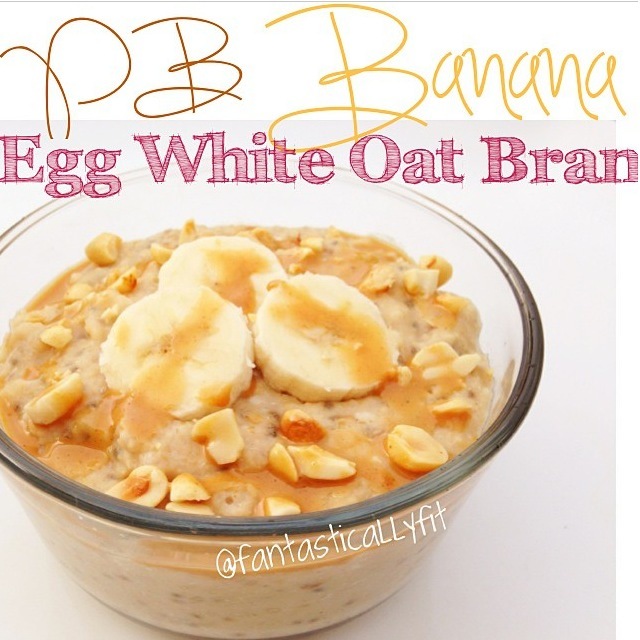 Fantastically Fit | Peanut Butter Banana Egg White Oats! Okay so let me tell you about the amazingness that is Egg White Oats! It is basically egg whites mixed into oatmeal at the end of cooking. Why is it so great? Well, you don’t taste the egg whites, it makes your oats WAY more fluffy, adds protein, and keeps you full longer! In a pot over medium heat mix together the oatmeal, water, vanilla extract, peanut flour, and chia seeds. When the oats are nearly cooked down with almost no water, add the egg whites and stir FAST until the egg whites are blended and cooked through. Then add the mashed banana and mix it in. Top with peanuts and sliced banana. Top with sliced banana (I used half), and more Peanut Flour mixed with water, or actual peanut butter! 0 Responses to "Peanut Butter Banana Egg White Oats!" my favorite combination. egg whites make a great consistency for oats! I know its the best!